Over 1000 new entries, over 4000 updates and corrections, countless new arguments ended (and begun). 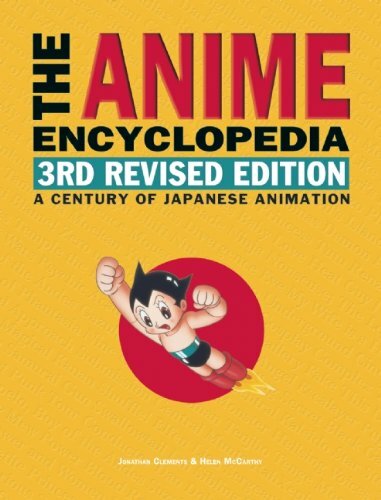 The third edition of the Anime Encyclopedia brings the landmark reference work up to date with six more years of information on Japanese animation, its practitioners and its products, as well as incisive thematic entries on its history and culture. It’s scheduled for publication in December, but already has a pre-order page up on Amazon (and in US). This entry was posted in News and tagged 3rd edition, anime, Anime Encyclopedia, books by ixarette. Bookmark the permalink. Hi I am producer at BBC Radio 4. Interested in speaking to you. Would you be able to email me a contact? Thank you. Any plans for a Kindle edition? Having a searchable electronic copy is handy for a work such as this (plus the hardback price puts it way out of impulse buy territory and some way into “something to consider if I get Christmas overtime”). Yes, there will be a Kindle edition. I have this preordered and I want to thank you for the hardcover edition. My old paperback of the previous edition is getting pretty worn out and threatens to lose its pages any day now.